The March 2019 RPM included the addition of a VIS/IR Sandwich RGB to AWIPS-II. To create the VIS/IR sandwich in the past, forecasters were required to overlay a semi-transparent IR over-top VIS. The RGB automates the creation of this image combination in AWIPS. The benefit of the VIS/IR Sandwich RGB is that it combines the high spatial detail apparent in VIS, with the temperature information of the IR. In a convective scenario, for example, a forecaster can utilize the RGB to monitor a cu field and boundaries as they normally would, since only the visible imagery will be present up to the point of convective initiation. Once the clouds have cooled enough during convective initiation, the IR component will be combined with the visible, allowing a forecaster to continue to visualize the detail in the cloud top via the VIS component, but also now the temperature information/trends from the IR in the developing storm. Post initiation, this combination improves identification of cloud top features such as overshooting tops, above anvil cirrus plumes, and gravity waves. In the RGB, forecasters are unable to sample the IR temperature, so trends must be gleaned from the colors. However, forecasters can underlay the IR channel so that brightness temperatures can be sampled. Figure 1 includes an example of rapid convective initiation to mature convection over the Texas Panhandle on 17 April 2019. In a little over one hour, the storm initiates and develops an overshooting top and above anvil cirrus plume. The rapid cooling is apparent in the imagery while the high detail of the VIS is maintained. Figure 2 shows the same storm a little later. One-minute imagery was available over the region to help forecasters monitor the evolution of convection. These storms produced large hail and tornadoes. An example from 18 April 2019 of a large QLCS advancing east across Louisiana and the adjacent Gulf shows the ability of the product to highlight storm top features such as overshooting tops, above anvil cirrus plumes, and storm top gravity waves (Fig 3). A Mesoscale Convective System (MCS) originating over Texas traversed the Gulf of Mexico during the evening of 07 April into the morning of the 8th. This system developed in association with a shortwave trough digging across the southern US plains and ahead of a east-moving surface cold front. GOES-16 10.3 um 5-min imagery captures the evolution of the MCS well (Fig 1). Periodic overshooting tops, above anvil cirrus plumes, and gravity waves are all apparent at storm top. GOES-16 GLM Flash Extent Density (5-min accumulation updating every 1-min) indicated an abundance of lightning activity with the cluster of thunderstorms (Fig 2). The field highlights the most intense updrafts (greatest FED), and shows lightning flashes extending well away from the main line of storms. The GLM Average Flash Area shows relatively small flashes associated with the main updrafts, while the flashes extending outward from the most intense cells are long (Fig 3). This makes sense, since stronger updrafts are typically associated with smaller flashes. Looking at the GOES-16 derived TPW field, the cold front pushing east behind the MCS is easily discernible. Behind the front, TPW values are around 0.5″, while values ahead of the front in the vicinity of the MCS are around 1.5″. Finally, 1-min imagery was available over the coastal areas to aid forecasters in tracking thunderstorms associated with the system. 1-min visible imagery at sunset reveals active thunderstorms, the development of new thunderstorms through the cirrus shield, and a number of gravity waves emanating away from the updrafts. An early April eastern US coast cyclone exhibited rapid intensification as it advanced north-northeast off the coast of North Carolina during the evening of 02 April 2019. A 24-hr GOES-East water vapor loop showed a shortwave trough quickly advance across the southeast US during the previous evening and interact with a low situated off the Georgia coast by the afternoon. The features organized into a single much larger storm that accelerated to the north-northeast just off the east US coast. Rapid strengthening of the storm is evident as dry air expands on the southwest descending side of the low, and cool air expands and clouds develop on the northeast ascending side of the low, wrapping around the center of the low in a counterclockwise manner. Convection is also obvious near the center of the low, as well as along a cold front extending south. MSAS MSLP analysis contours overlaid on the water vapor imagery help depict the organization and deepening of the surface low. 1-min imagery was available over the storm to aid forecasters in analyzing its evolution, particularly convective elements during the day. Figure 2 combines 120 minutes of 1-min visible imagery with 1-min Flash Extent Density (FED) 5-min accumulation. The imagery reveals persistent convective activity on the northwest side of the low. Towards sunset, convection develops quickly southeast of this area of convection, as evidenced by a rapid increase in FED. 1-min IR imagery also shows rapid cooling of cloud tops in this area, indicating updraft acceleration, with consistently cold tops in the broad area of convection to the northwest. Adding to Bill’s post, my colleagues and I at the NWS Ocean Prediction Center were looking at this impressive storm through the Air Mass RGB and 1-min visible imagery as we issued hurricane-force wind warnings for the Offshore Zones. The above animation shows the evolution of a meso-low on the southwest flank of a supercell-like thunderstorm, which becomes the new surface low pressure. Vorticity increases and the pressure falls (~13 mb in 3 hours!). A snapshot around 2014 UTC on 04/02/19 shows the main thunderstorm updraft with surface low pressure nearly coincident. The arrows point to the cold conveyor belt (north of low), the dry, descending air scouring out low-level clouds on the south side of the convection (see Air Mass imagery below), and a wavy coastal front that will aid in the development of the bent-back front. It appears in the animation that some extreme winds are pushing out the southwest flank of the supercell with a haze near the cloud edge. Could this be precipitation being pushed out similar to a rear-flank downdraft? Or is it sea spray? Regardless, at the time of this image, winds were estimated over 65 kt (75 mph) and possible gusts approaching 90 kt (105 mph)! Finally, these two images showcase the Air Mass RGB utility in a rapidly intensifying extratropical cyclone. The GLM is highlighting the lightning flash density near the supercell mentioned above and the convection that is lined up along a pre-frontal trough and eventually a fast moving cold front. The dry, descending air (red coloring) is indicative of stratospheric air that is descending rapidly and transporting potential vorticity (PV) towards the developing coastal storm. Note how the upper-level feature moving through the southeast U.S. loses organization as the energy jumps to the coast storm and associated strong convection. We will try to update this blog post as necessary with new findings, but as of 11 pm EDT (0300 UTC), winds are subsiding on the Outer Banks of NC after gusts of 60-70 mph were reported. This leads me to believe that stronger gusts existed with the nearly closed, eye-like feature observed on radar tonight. As of 1600 UTC on April 2, 2019, 10-minute Flex Mode (Mode 6) has permanently replaced Flex Mode (Mode 3), for both GOES-16 and GOES-17. As has been outlined in previous blog posts, the difference between the two modes is that Mode 3 scanned a full disk every 15-minutes, while the new Mode 6 scans the full disk every 10-min. The CONUS and mesoscale sector coverage remains the same. Continuous Full Disk Mode (Mode 4) will continue to be available upon request. See the chart below comparing how often each sector is scanned in the three scan modes. The following tweet displays the coverage provided by GOES-West and GOES-East sectors. Note the mesoscale sectors are movable. These images also exemplify the degradation of pixel size further from the satellite sub point. Below are examples of GOES-West and GOES-East full disk coverage from the afternoon of 02 April 2019 over a five hour period. Five hours of full disk imagery now includes 30 images with Mode 6, vs 20 images with the old Mode 3. An isolated severe storm brought large hail to northern portions of Oklahoma City on 23 March 2019. GOES-16 1-min imagery was available over the region to support severe weather forecast and warning operations. Water vapor imagery shows convective development across Oklahoma south of a broad upper low (Fig 1). Prior to convective initiation, stable wave clouds (aka billow clouds) were apparent over the OKC area and east, signaling the presence of low level stability. As the day progressed, destabilization was apparent west of OKC as a cumulus cloud field developed. A southwest to northeast oriented axis of enhanced cumulus cloud growth (towering cu and clumping cu) eventually become apparent, signalling the most likely zone of imminent convective initiation (Fig 2). The Day Cloud Phase Distinction RGB further highlights imminent initiation through the transition of cu from “light blue” to “green” within the cu field (Fig 3). This color change comes from the blue contribution (snow/ice band) decreasing (ice increasing in clouds), while the green contribution (red VIS) is relatively high (highly reflective clouds). The red contribution (IR window) is low, but may also be increasing as the cloud tops cool. In other words, glaciation is starting to occur within the cloud. Moving forward another hour, convection initiates within the zone of increasingly agitated cumulus clouds (Fig 4). Plotting GLM Flash Extent Density during the first hour of initiation, a rapid increase in lightning activity is apparent leading up to the first NWS warning and hail report (Fig 5). The increased lightning activity signals a strengthening updraft. Finally, looking at storm evolution with respect to GOES-16 derived CAPE, convection developed within a local max of CAPE of around 800 j/kg (Fig 6). Strong to severe thunderstorms brought swaths of accumulating hail, including some large severe hail, to parts of the Texas Panhandle on 22 March 2019. Reports of hail up to 2.75″ in diameter were received by the National Weather Service. Photos and videos on social media showed hail covered roads and highways. IR satellite imagery showed the storms advancing across the Panhandle during the early evening (Fig 1). Temperatures during the evening behind the storms dipped into the upper 30s, preventing much of the hail from melting. GOES visible and RGB imagery the next morning showed hail swaths still in place, extending from well southwest of Amarillo to northeast of Amarillo. The hail-covered surface appears as green in the Day Cloud Phase Distinction RGB imagery, similar to snow (Fig 2). This RGB combines the 0.64 um VIS, 1.6 um snow/ice NIR, and 10.3 um IR to differentiate low clouds (light blue) from high clouds (red) from snow/ice-covered ground (green) from bare ground (darker blue). This differentiation is much more difficult when using any single band alone. It has been great year so far for snow across the mountains of southern Colorado. 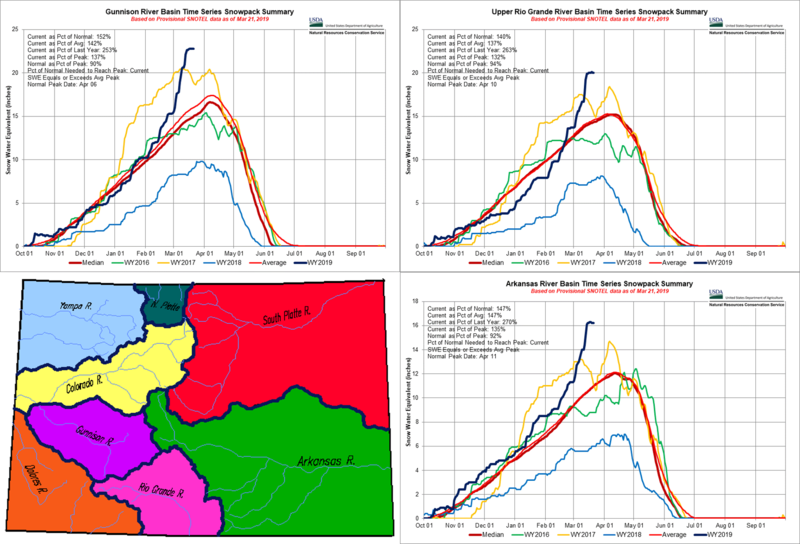 Current snowpack (as of Mar 21) across the Gunnison, Upper Rio Grande, and Arkansas River Basins are 152%, 140%, and 147% of normal, respectively. The above normal snowpack is appreciated, as it is coming on the heals of a year in which snowpack was well below normal. These trends are captured in Fig 1. The snowpack is easily diagnosed in satellite imagery (MODIS imagery here). 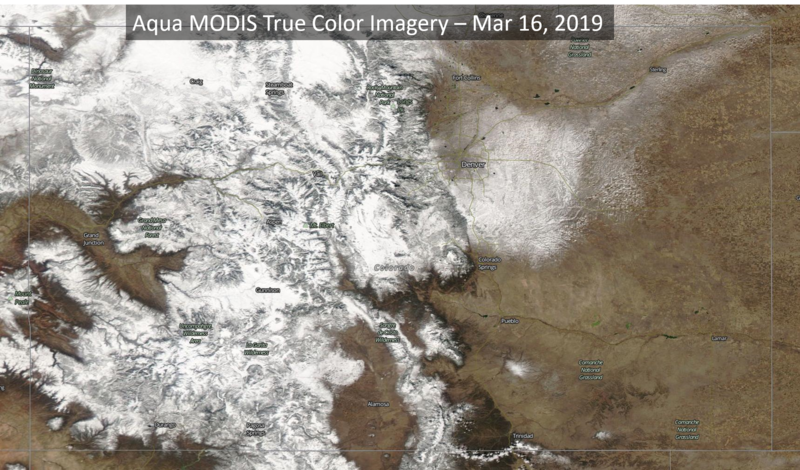 A ridge of high pressure over the western US allowed for clear views of the snow cover over Colorado on 16 March 2019, several days removed from a significant snowstorm (Fig 2). Compared to the same day last year (Mar 16, 2018), the improved snow cover is easily apparent (Fig 3). Next, we look at the trend of snow cover across Colorado on clear days during the 2018/2019 winter (Fig 4). The National Operational Hydrologic Remote Sensing Center (NOHRSC) runs a model that assimilates satellite data, ground observations, and airborne observations to create daily snow maps. 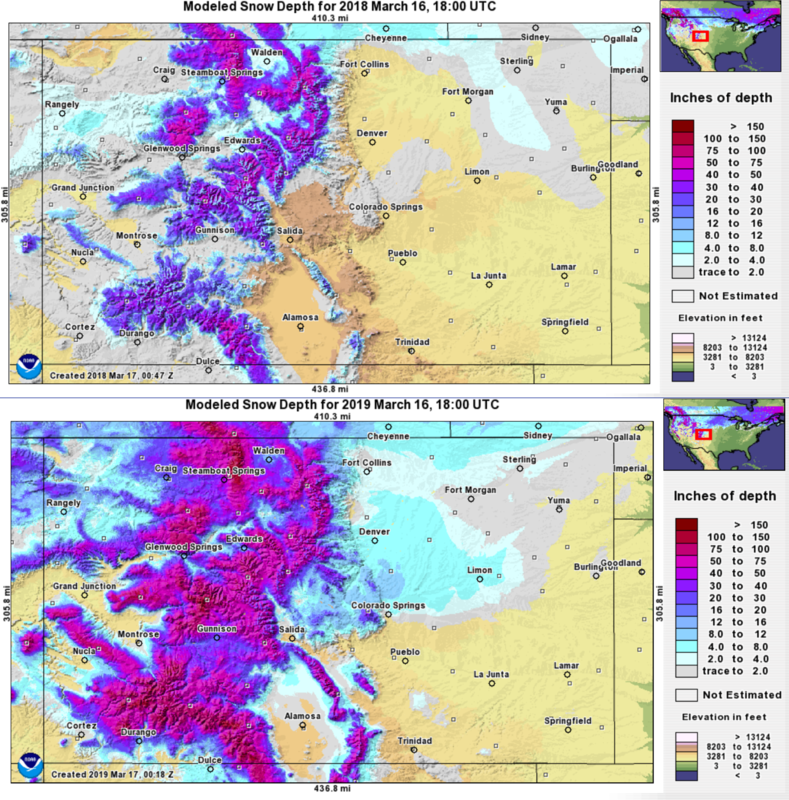 Figure 5 includes a comparison of NOHRSC snow depth for March 16 in 2018 and 2019. The improved snow cover and snow depth is obvious from these images.